Len Sunukjian '64 heard the call to vocational ministry while earning a master's in education and a teaching credential at Stanford. The youth pastor at Peninsula Bible Church got him involved with Young Life, which awakened his interest in ministry. A social science major at Westmont, Len finished at Stanford before attending Dallas Theological Seminary. He met his wife, Diana, in Dallas, where they both worked with Young Life. Len's career in ministry includes 12 years leading programs and teaching at Mt. Hermon Christian Conference Center and 17 years pastoring two churches in Santa Barbara: Grace Church (now Shoreline Community) and Chapel of the Hills (now Hope Community). He became ministries director for the Missionary Church Western District in 2000, working with pastors in five western states. Today he serves pastors in full-time ministry through FishBowl Ministries, which he joined in 2013. Diana raised their two sons, Jason '95 and Luke '97, and went back to school to become a marriage and family therapist. She worked in the Westmont Counseling Center for seven years and helped cofound Hope Counseling Center in Santa Barbara. Both sons appreciate the close friendships they developed at Westmont. Jason and his wife, Heather Hippenhammer Sunukjian '01, live in Santa Barbara with their two children. He works for Lynx Property Management, and she is an occupational therapist at Cottage Hospital. Luke and his wife, Melanie, also settled in Santa Barbara with their four kids. He teaches mathematics at Providence High School, and she is a Director with Trades of Hope. 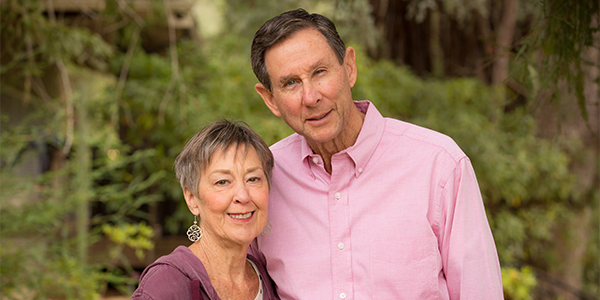 When Len and Diana planned their estate, they set up a trust that includes Westmont and organizations important in their lives. They see it as a way to give back, especially as their sons received financial aid. "We all had such a fabulous experience there," Diana says. "Len and the boys benefitted from the strong academic program, the great teachers and the wonderful student life programs. We appreciate Westmont." Reproduced with permission from the November 2014 Toward Tomorrow Newsletter. For more information about including the college in your revocable trust, please contact the Office of Gift Planning at (805) 565-6058 or giftplanning@westmont.edu.